Wet to moderate moisture. 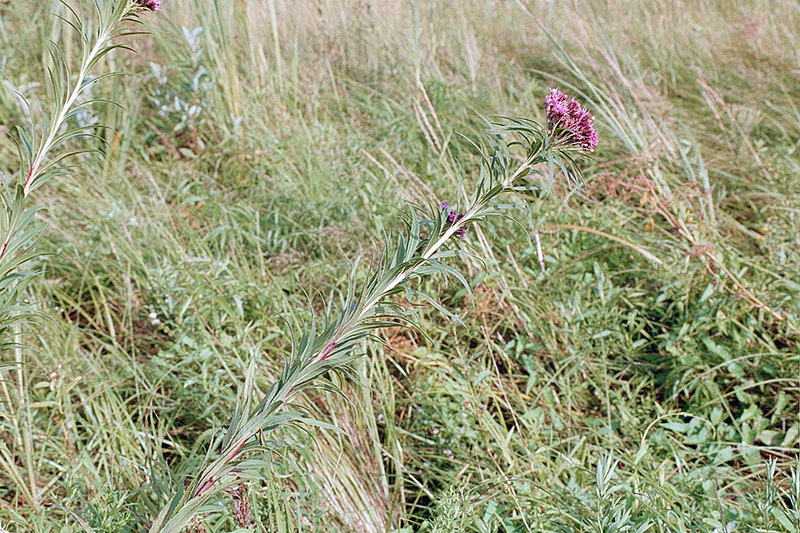 Prairies, meadows, pastures, marshes. Full sun. 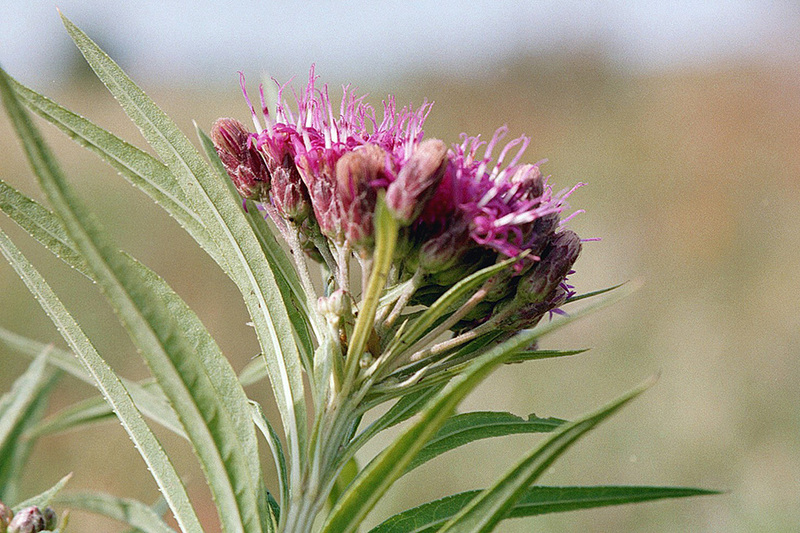 This is a 20″ to 55″ tall, erect, perennial forb that rises on a single stem or a clump of 2 or more stems from a stout, thickened rootstock. 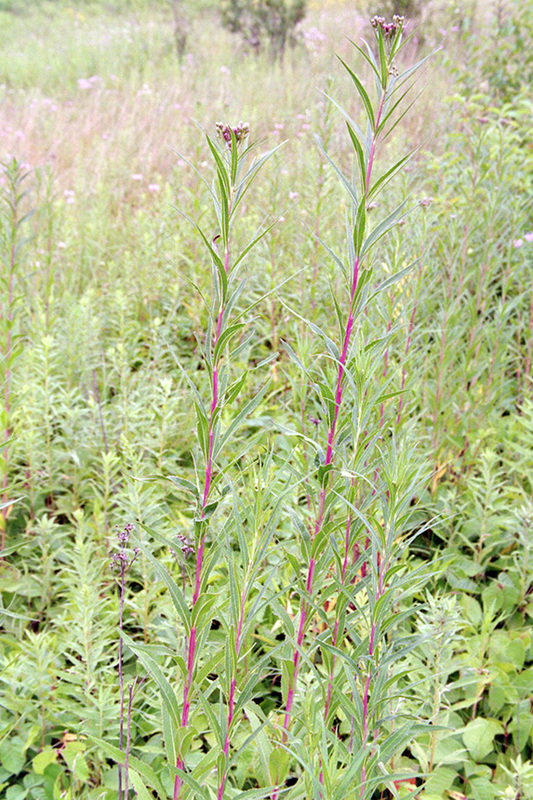 The stems are erect, round, light green or reddish-purple, and unbranched below the inflorescence. The are usually hairless but are sometimes minutely hairy near the top. 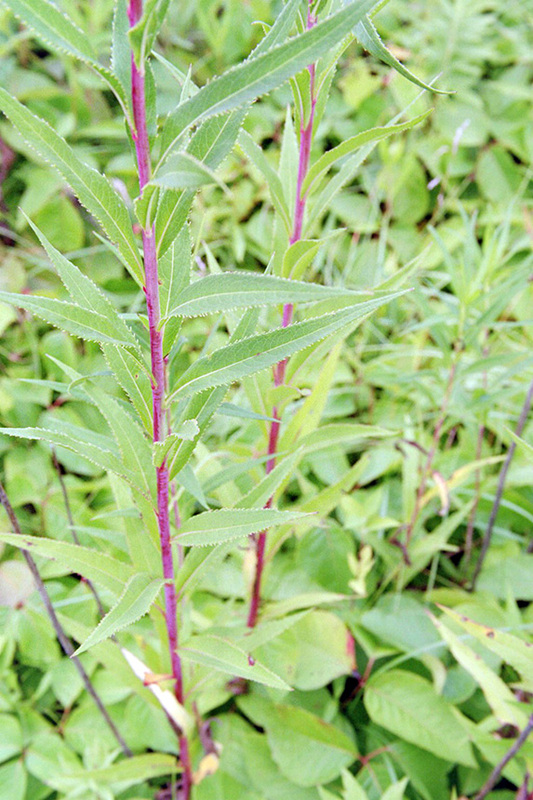 The leaves are alternate, stalkless or on short leaf stalks, narrowly to broadly lance-shaped, 2″ to 7″ long, and ⅜″ to 1½″ wide. 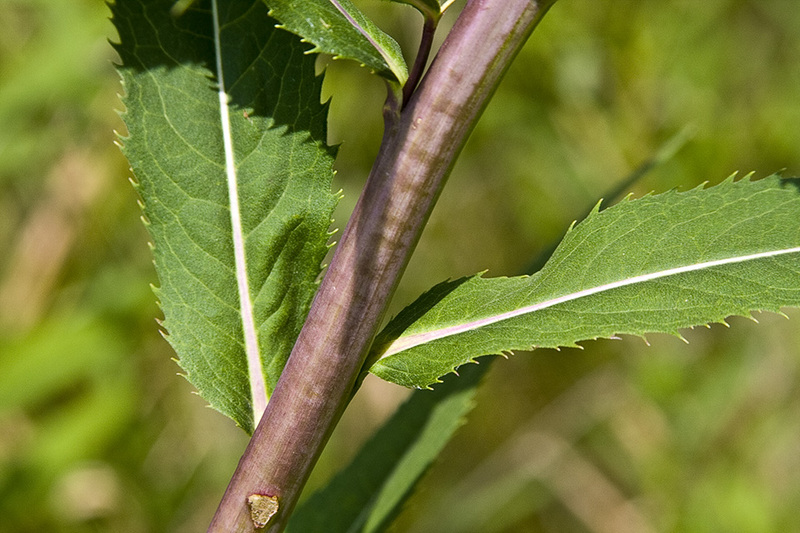 The leaf blades are tapered at the base and taper to a sharp point at the tip. The upper surface is green, smooth to the touch, and mostly hairless but may have fine short hairs near the margin. The lower surface is similar in color, hairless, and dotted with minute pitted glands. The glands appear as translucent dots when the leaf is held up to the sun or another light source. The margins are sharply toothed. 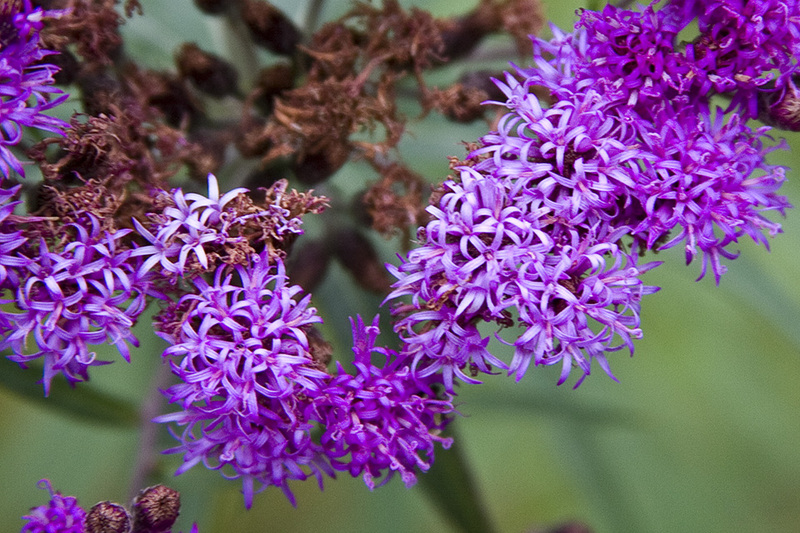 The inflorescence is a dense, branched, 1½″ to 4″ wide, flat-topped cluster (cyme) of many flower heads at the end of the stem. 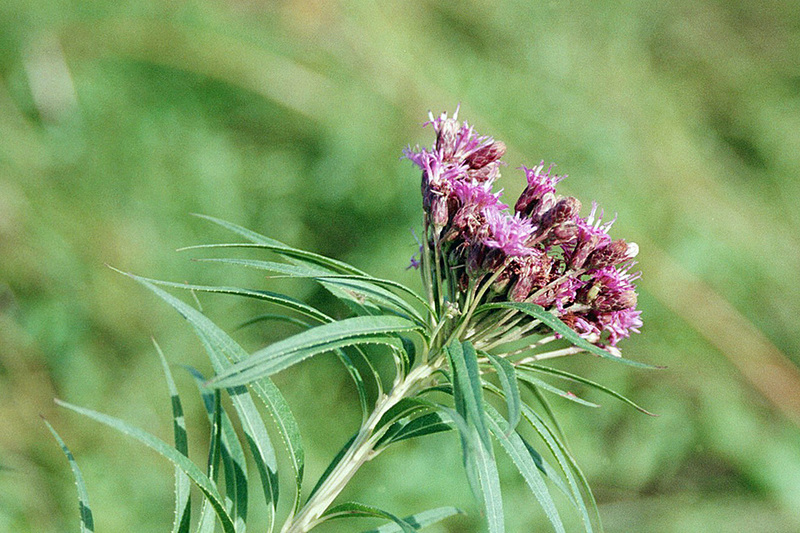 The flower heads within the cyme are not grouped into secondary head-like clusters. 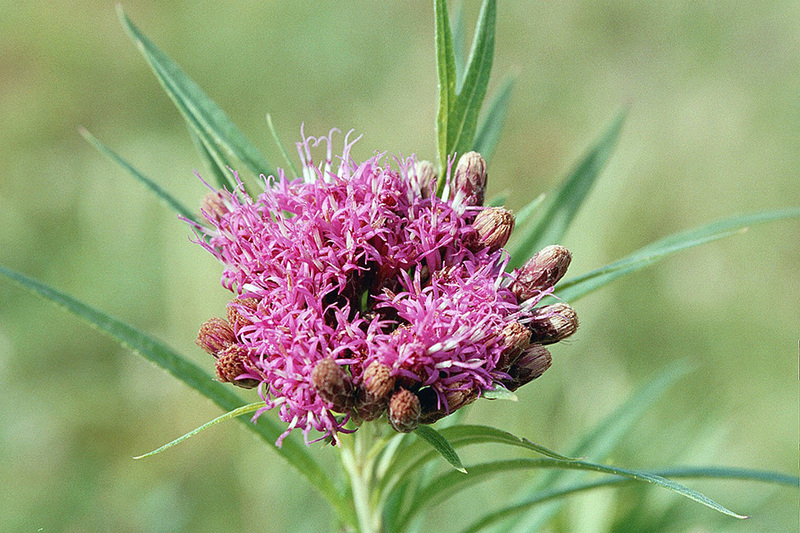 The base of each flower head (involucre) is bell shaped, 3 ⁄16″ to ⅜″ long and ⅛″ to ¼″ high. The involucre is composed of 25 to 35 or more modified leaves (bracts) in 4 or 5 overlapping series. 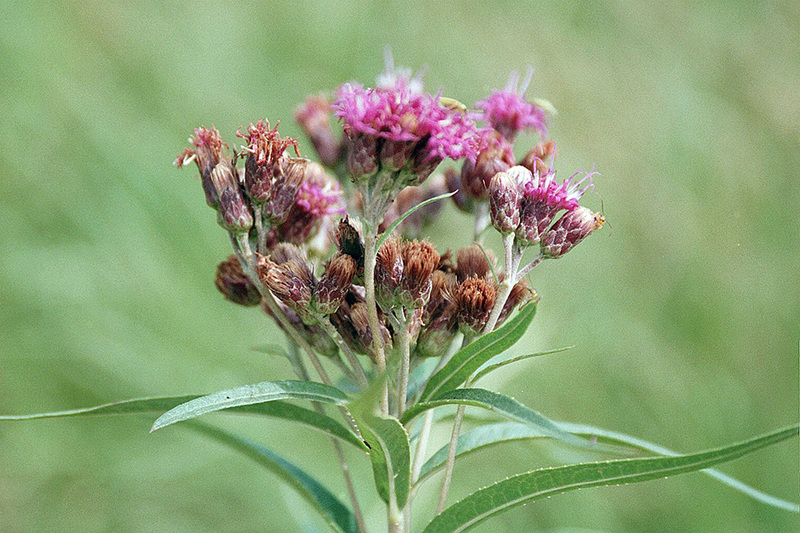 The involucral bracts (phyllaries) are ⅛″ to ¼″ long, and their tips are pressed closely to the involucre. 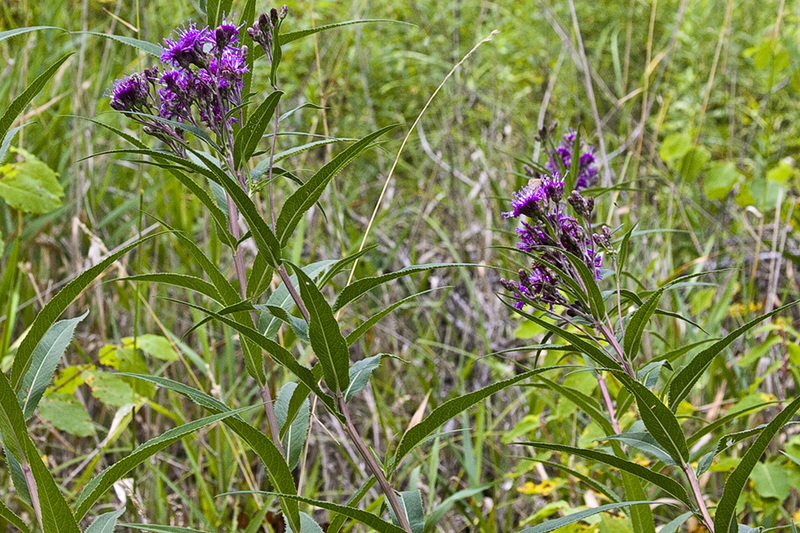 They are green but usually tinged purplish along the midvein and toward the tip. They are mostly hairless on the back but sometimes have sparse, long, cobwebby hairs on the margins. The outer phyllaries are broad and scale-like. The inner ones are narrow. Each flower head has 10 to 26 disk florets and no ray florets. The disk florets are purple and ⅜″ to 7 ⁄16″ long. They are tube-shaped at the base then separated into 5 long, widely spreading lobes. The flowers have no noticeable scent. The fruit is a dry, brown, one-seeded, 1 ⁄16″ to ⅛″ long seed capsule (cypsela) with a modified calyx (pappus) is attached to one end. The pappus is in two series: an outer ring of 20 to 30 minute scales, and an inner tuft of 35 to 45 tan to brownish-purple, 3 ⁄16″ to ¼″ long hair-like bristles. 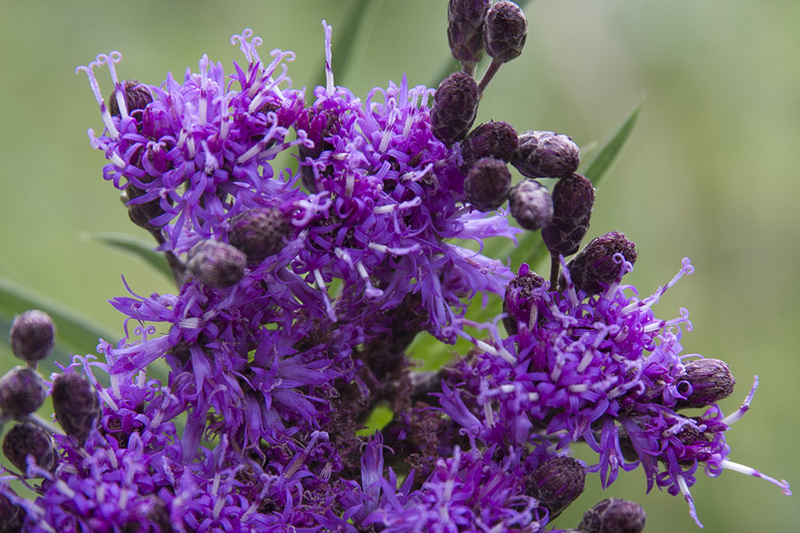 Western ironweed (Vernonia fasciculata ssp. corymbosa) is a much shorter plant, reaching only 12″ to 24″ in height at maturity. 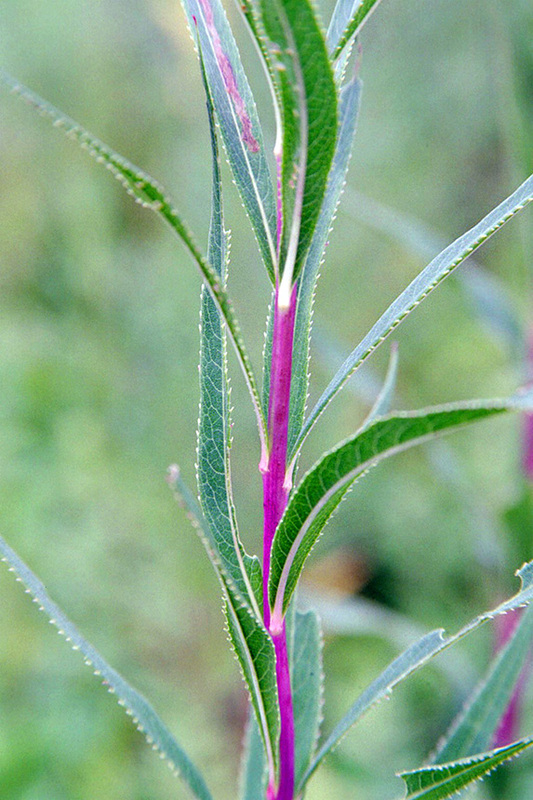 The leaves on the main part of the stem are shorter, 1½″ to 4″ long, wider, and rough to the touch on the upper surface near the margins. In Minnesota it is found only in the western border counties and in the southwest. 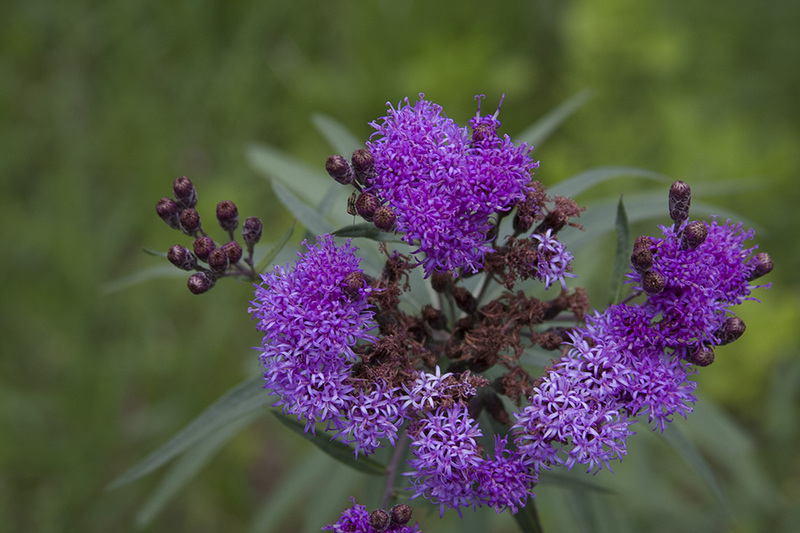 Baldwin’s ironweed (Vernonia baldwinii ssp. 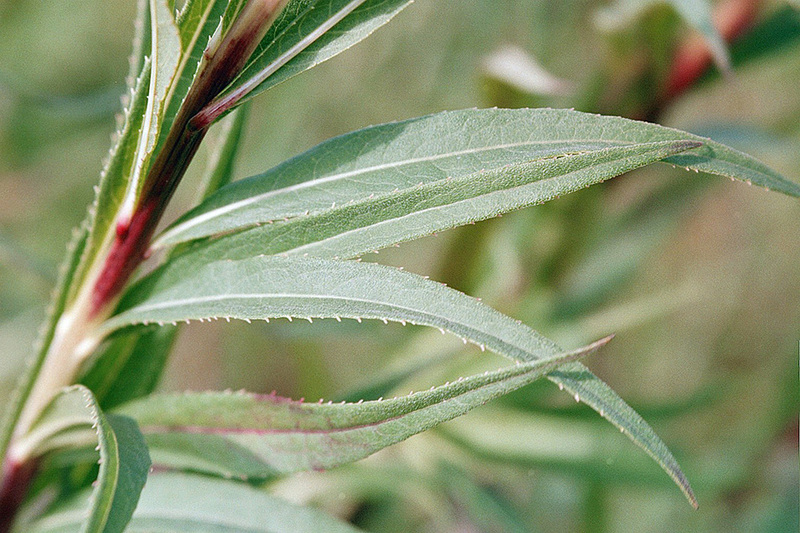 interior) has hairs on the underside of the leaves that obscure any translucent dots. 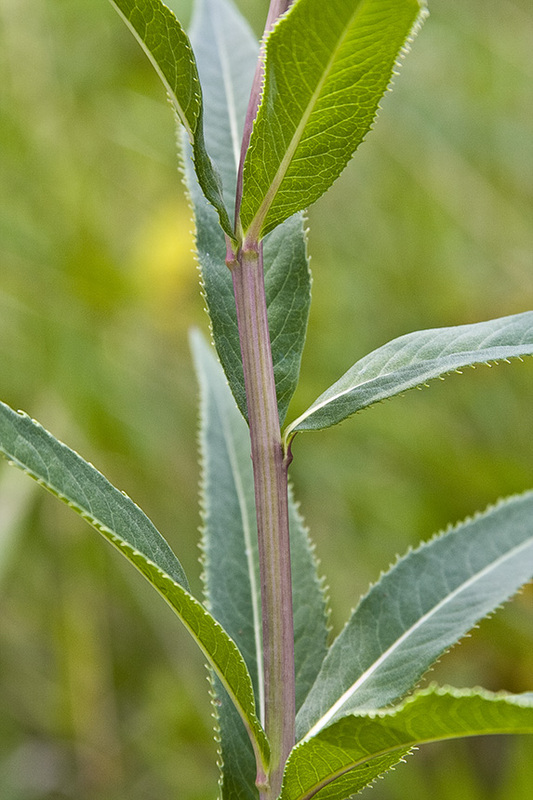 The tips of the bracts in the involucre curve backward. It has been reported only in Crow Wing (in1890) and Goodhue (in 2000) Counties.